When choosing a gift for a bride and groom, I like to find something that they can enjoy together. 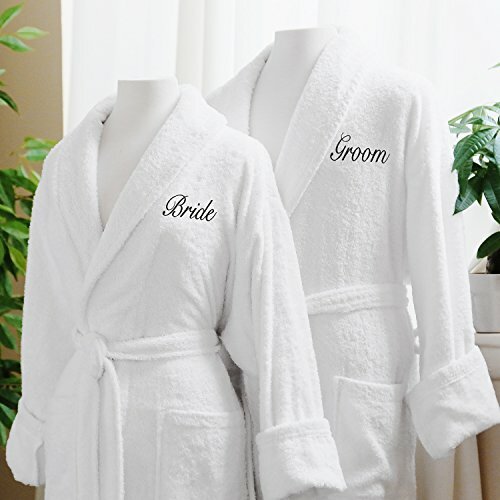 It could be a set of glasses, towels or an ice bucket, but one thing that I found that adds a bit of luxury is a lovely set of Personalized Bride Groom Robes. This set is my favorite and I noticed a favorite of many others too, according to the excellent product reviews. If you are looking for a wedding gift that has a luxurious “WOW Factor”, bride and groom robes are the way to go. These lovely robes will take a couple from a honeymoon trip to home where they can enjoy their robes everyday. A gift of luxury for the newlyweds will make them feel special and pampered. How nice for a newlyweds to feel wonderful in comfy robes! I find it to be a nice option that embroidery choices on the robes are quite flexible. Through standard ordering, the embroidery options are: His/Hers, Bride/Groom or Mr/Mrs, which are three nice choices. If you prefer to personalize with the bride and groom’s first names or last name, this company is very accommodating. Send them a message before ordering and they will be very helpful in explaining the ordering process. 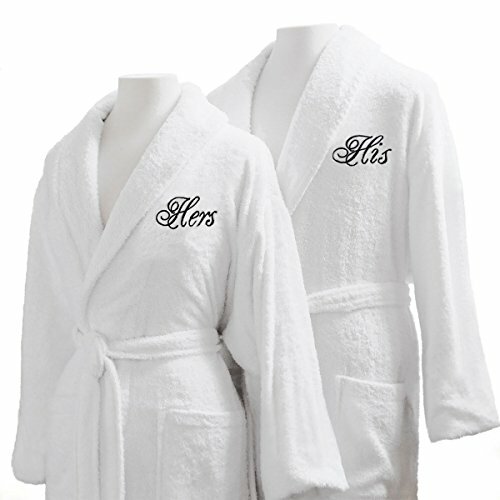 These Bride and Groom Robes are made of fine Egyptian cotton terry cloth which makes them warm and cozy. They are a perfect weight, not too heavy or light, but just right. The fit is large, as robes should be, and they are roomy and comfortable for lounging or bath time and the length is generous. Personalized Bride and Groom Robes are also available in a Waffle Weave texture, which is equally nice. The Personalized Bride Groom Robes have a very nice option of gift packaging. For a small fee, the robes are wrapped in a signature Luxor Linens elegant gift box, ready for giving. Having a gift box already with your order saves time and money, plus it’s so easy to have the bride groom robe set packaged and ready for the happy couple. I love these bath robes what a lovely idea for a wedding gift. I think that personalized robes that match your partner is so romantic!! One of the many things I look forward to in my future. I can have more than one right? Because I don’t know if i can choose. They would make a nice wedding gift.